February 14th is often a day full of chocolates, teddy bears and proposals. But, what if you haven’t found the one your heart desires yet? What if God is calling you to a life of singleness? Or, what if He is asking you to practice patience as He paves a way for you and your future spouse to meet in His perfect timing? Does being single on Valentine's Day mean you can’t participate in the one day a year set aside to celebrate love? Absolutely not. The Lord calls us to love one another because love binds everything together in perfect harmony. There’s nothing more kind than sending a friend a sweet Valentine's Day card to remind them of the joys, laughs and tears you two shared! Each friendship brings blessings into our lives. Let’s use this Valentine’s Day to let our friends know that they were fearfully and wonderfully made and have great things to offer the world. 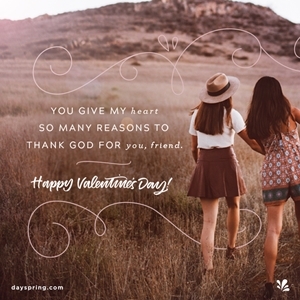 Explore some ideas for Valentine’s Day gifts for your best friends, like this Friends Put God’s Goodness on Display Photo Clipboard that offers a powerful message worth reminding our friends! Try something out of the ordinary to bless your friendships by hosting a bestie Valentine tea party! Invite a group of your friends to your house, set the table, and eat delicious sandwiches as you catch up and sip on hot cups of tea. At the end of your time together, let your friends know they can take the teacups home with them—that way, every time they drink out of their teacup, they will be reminded of your friendship. Let’s embrace this love-filled holiday with our besties and remember to show kindness, cherish our relationships and to bless them. Looking for a way to brighten your bestie's day right now? Send her a friendship Ecard to let her know how much she means to you! Let’s use this Valentine’s Day to let our friends know they are loved.